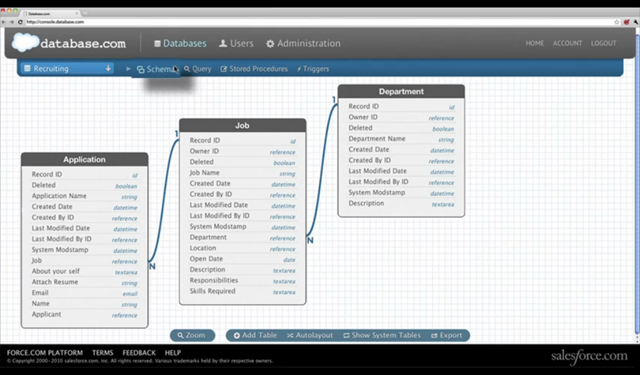 At Dreamforce today Salesforce.com announced its latest platform venture: Database.com. Salesforce.com is built on an Oracle database with various custom optimizations; and database.com now exposes this as a generic cloud database which can be accessed from a variety of languages – Java, .NET, Ruby and PHP – and accessed from applications running on almost any platform: VMForce, Smartphones, Amazon EC2, Google App Engine, Microsoft Azure, Microsoft Excel, Adobe Flash/Flex and others. One way to use it would via JPA (Java Persistence API) in an VMForce Java application. 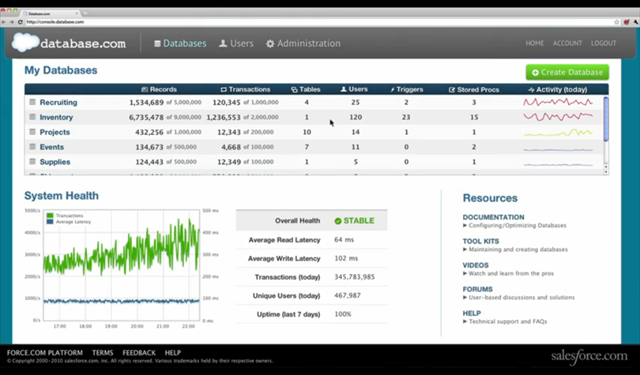 The Database.com console is a web application that has a console giving access to your databases and showing useful statistics and system information. 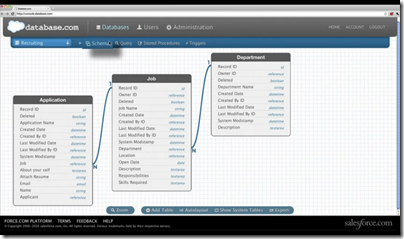 You can also create new databases, specifying the schema and relationships. The details presented in the keynote today were sketchy – we saw applications that honestly could have been built just as easily with MySQL – but there is more information in the FAQ. The Database.com API is through SOAP or REST web services, not SQL. Third parties can create drivers so you can you use it with SQL APIs such as ODBC or JDBC. There is row level security, and built-in full text search. According to the FAQ, Database.com “includes a native trigger and stored procedure language”. Pricing starts from free – for up to 100,000 records, 50,000 transactions and 3 users per month. After than it is $10.00 per month per additional 100,000 records, $10.00 per month per additional 150,000 transactions, and $10.00 per user if you need the built-in authentication and security system – which as you would expect is based on the native force.com identity system. As far as I can tell one of the goals of Database.com – and also the forthcoming chatter.com free public collaboration service – is to draw users towards the force.com platform. Roger Jennings has analysed the pricing and reckons that Database.com is much more expensive than Microsoft’s SQL Azure – for 500 users and a 50GB database $15,000 per month for Database.com vs a little over $500 for the same thing on SQL Azure, though the two are difficult to compare directly and he has had to make a number of assumptions. Responding to a question at the press and analyst Q&A today, Benioff seemed to accept that the pricing is relatively high, but justified in his view by the range of services on offer. Of course the pricing could change if it proves uncompetitive. Unlike SQL Azure, Database.com starts from free, which is a great attraction for developers interested in giving it a try. Trying out Azure is risky because if you leave a service running inadvertently you may run up a big bill. In practice SQL Azure is likely to be more attractive than Database.com for its core market, existing Microsoft-platform developers. Microsoft experimented with a web services API for SQL Server Data Services in Azure, but ended up offering full SQL, enabling developers to continue working in familiar ways. Equally, Force.com developers will like Database.com and its integration with the force.com platform. Some of what Database.com can do is already available through force.com and I am not sure how the pricing looks for organizations that are already big salesforce.com users; I hope to find out more soon. What is interesting here is the way salesforce.com is making its platform more generic. There will be more force.com announcements tomorrow and I expect to to see further efforts to broaden the platform then. Update – I had a chat with Database.com General Manager Igor Tsyganskiy. He says Microsoft’s SQL Azure is the closest competitor to Database.com but argues that because Salesforce.com is extending its platform in an organic way it will do a better job than Microsoft which has built a cloud platform from scratch. We did not address the pricing comparison directly, but Tsyganskiy says that existing Force.com customers always have the option to “talk to their Account Executive” so there could be flexibility. Since Database.com is in one sense the same as Force.com, the API is similar. The underlying query language is SOQL – the Salesforce Object Query Language which is based on SQL SELECT though with limitations. The language for stored procedures and triggers is Apex. 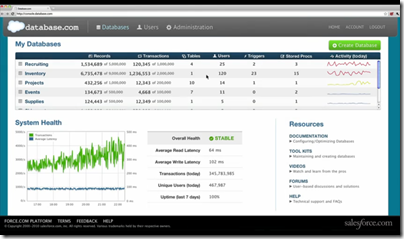 SQL drivers from Progress Software are intended to address the demand for SQL access. I mentioned that Microsoft came under pressure to replace its web services API for SQL Server Data Services with full SQL – might Database.com face similar pressure? We’ll see, said Tsyganskiy. The case is not entirely parallel. SQL Server is a cloud implementation of an existing SQL database with which developers are familiar. Database.com on the other hand abstracts the underlying data store – although Salesforce.com is an Oracle customer, Tsyganskiy said that the platform stores data in a variety of ways so should not be thought of as a wrapper for an Oracle database server. Although Database.com is designed to be used from anywhere, I’d guess that Java running on VMForce with JPA, and following today’s announcement Heroku apps also hosted by Salesforce.com, will be the most common scenarios for complex applications. You might get a big bill if you leave an Azure web or worker or VM role running. SQL Azure is always a low-ish, flat fee, and Azure tables are always cheap. When comparing with database.com, I think the data pricing is the more appropriate point of comparison. Roger Jenning’s pricing model is wrong and looks very inflated. He assumed every time you bought a user you also had to buy storage and transactions for that user. The pricing we published is a-la-carte. You can only keep three free users and just buy transactions or just buy storage. Or one can add users but not add either storage or transactions. There will also be a notion of the “light user” — authentication only and cost of buying those will be way less then a dime per “light user”. Light users are usually company’s customer’s or doctor’s patients. I understand that pricing is ala carte, but adding users implies to me that new users will generate transactions to read records and, presumably, also add records to the database. I would expect new users to be more active than the user population as a whole. There was no mention of the notion of a “light user,” which I assume to have only read-only access, in the Database.com documentation I’ve read to date. SQL Azure “light users” would only incur US$0.10/GB data egress charges only. I’ve just published the start of a “Preliminary Comparison of Database.com and SQL Azure Features and Capabilities” at http://oakleafblog.blogspot.com/2010/12/preliminary-comparison-of-databasecom.html. You might want to comment on that. Tim, we are working on making pricing more clear and explicit on http://www.database.com. You will see updated pricing there shortly. On Comparison of Database.com and SQL Azure, we will be able to publicly provide the information closer to our GA date later in the year.